We all want to keep our smiles looking great, but most of the time using a mouthwash could be doing more harm than good. Think about this, when Listerine was first released it was marketed as a surgical antiseptic and a powerful floor cleaner. The internet is also full of shocking things that Listerine can clean, so how safe it is really? Mouthwash has been around for thousands of years, and there is evidence that people have been using mouthwash as far back as 2700 BC in China. These mouthwashes were simple saltwater rinses, and were used to treat gum disease. Alcoholic mouthwashes that are popular today started in the 1600’s and were used to kill bacteria in the mouth. However, they would not be effective until the 1900’s. Listerine was created in the 1870’s and was originally created as an antiseptic. It was re-marketed in the 1920’s and its sales increased by 8000% in 10 years when it became a mouthwash. Today, we have dozens of options to pick from, but are any of them actually good for us? Most of us would never question using mouthwash, but a new study has found a link between mouthwash and diabetes. The study was published in the journal Nitric Oxide. The study followed 1206 people for over three years and found that people who used mouthwash twice a day were 30 percent more likely to have developed either pre-diabetes or diabetes. However, mouthwash does not only increase our risk of diabetes. There are many other downsides of using mouthwash regularly. Here are just a few. Like hand sanitizers, mouthwash kills all bacteria in your mouth. Yes, your mouth is full of bacteria. But that is a good thing. The bacteria that naturally live in your mouth can protect you from dangerous bacteria that we breathe in or eat. Many types of mouthwash are antibacterial, so they kill all the bacteria, even the good ones. This causes us to become sicker more often. The loss of the bacteria also reduces the production of nitrites. Nitrites help your blood vessel to contract and expand efficiently. A study found that the lower nitrite production can cause an increased risk of cardiovascular disease. When you use mouthwash regularly, it can feel like your mouth is clean, when it really is not. It is like spraying a car down with a strong hose since some dirt comes off, but there is still some dirt and grime attached. A healthy and clean mouth requires regular brushing and flossing. If you substitute brushing and flossing for mouthwash, you are putting yourself at risk for cavities, gingivitis, and other oral healthcare issues. The University of Glasgow researchers found that using mouthwashes that contained alcohol more than three times a day could increase the risk of developing oral cancer. These findings support research conducted in Australia in 2009. However, the ADA (American Dental Association) has been debating the question of if mouthwashes with alcohol are safe for decades. There are a lot of things that we eat and do daily that can cause tooth sensitivity. Most times, using a mouthwash too often or using the wrong one can also do this. Many times, the alcohol and other chemicals that are meant to kill the bacteria in our mouths can make tooth sensitivity worse. This is especially true if your dentin is exposed. Whitening mouthwashes are the worst option because they have harsher chemicals in them to remove stains and make our teeth look whiter. These chemicals can destroy enamel, leading to tooth sensitivity. Some mouthwashes are designed to help with tooth sensitivity. However, most only numb or make a thin barrier to protect the teeth for a short amount of time. If mouthwashes were to taste like their main ingredients, no one would want them. They would taste like pure alcohol or would taste very bitter. This is why nearly all mouthwashes that you find in stores have flavors added to them, like mint. However, most flavors added are made with high amounts of sugar or chemical sweeteners. This has been a problem with many oral care products for decades and it is only now being addressed. Oral care products for kids have been a major concern because of the sugar and sweeteners that could be in their flavors. Washing your mouth out with sugar or a chemical sweeteners means you are allowing the bacteria that is formed by sugar to come back sooner, and your body does not have its natural bacteria to break it down. This can lead tooth decay and sensitivity. Oral health is very important because it can affect our overall health. Chronic bad breath is a side effect of many oral health issues, and also some digestive issues. Instead of using mouthwash to mask your bad breath, you should be looking for the cause of the bad breath. The regular use of alcohol-based mouthwashes has been found to dry out the mouth. This can cause worse bad breath, tooth sensitivity, and cavities. The lower spit production can also lead to more throat issues like coughs and problems swallowing. Many types of mouthwash say they are not for consumption, and to avoid swallowing it. 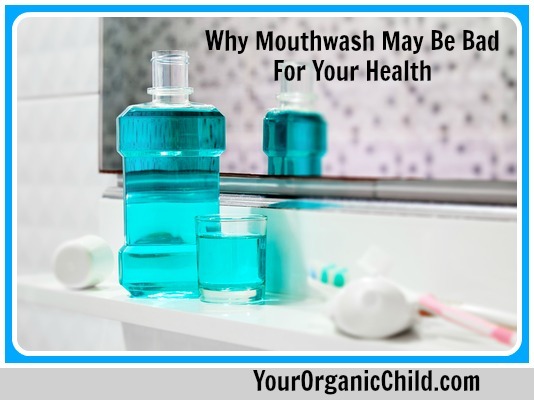 This is mainly due to the fact that the alcohol in mouthwashes is a high percentage, and many other ingredients in mouthwashes are not meant to be consumed at all. This is one of the main reasons why mouthwashes are not recommended for children. If you do swallow some mouthwash, you will most likely be fine. However, it can painful or even deadly if you were to consume a lot of mouthwash. There are mouth rinses that are prescribed by dentists if you are having periodontal surgery or oral health care problems. You should follow your dentist’s instructions if you are prescribed a mouth rinse. There are some safer options that you can use if you want to continue using a mouthwash. A simple salt rinse is one of the best options when you have a cold sore or a sore throat. It can be made using warm (not hot) water and salt, and you just need to swish it around your mouth. The salt helps kill the harmful bacteria that is causing the pain. If you continue having a sore throat or a painful cold sore, you should talk to your dentist or doctor. Oil pulling can also be a great option to help keep your mouth clean. Oil pulling is an ayurvedic healing treatment, which removes toxins from the body. It is done by swirling a tablespoon of olive, sesame, or coconut oil around your mouth for 5 to 20 minutes. After swirling the oil around, spit it out, rinse your mouth, and then brush and floss your teeth. This can be very relaxing for some people and offers many benefits including whitening teeth. It can be very tempting for people to use mouthwashes at times because we are very worried about oral health care and bad breath. However, regular brushing and flossing is usually more than enough to keep your mouth healthy. The risk of becoming sick from using mouthwash is simply not worth having a minty fresh mouth.